At the offset, their objective seems clear to me – to make the cars lap nearly 10 seconds faster in the seasons to come. One that most fans would agree with as well! I will give credit where it is due – they are attempting to crawl back those lost seconds by proposing to introduce wider tyres and re-fueling. While I understand the technical side of Formula1, it isn’t my strength, so I will leave this for the experts and their views. In a special mid-week episode of the Inside Line F1 Podcast, Rishi and I speak about the ‘strategy of errors’ unleashed on us by the F1 Strategy Group. Tune in! The Inside Line F1 Podcast is now available on various platforms and I would welcome you to choose your platform to listen to the humour that we add to the otherwise serious and complex sport of Formula1. And while our podcast frequency is weekly, come ‘like‘ the Inside Line F1 Podcast on Facebook and on Google+ for frequent humorous updates from the world of Formula1. 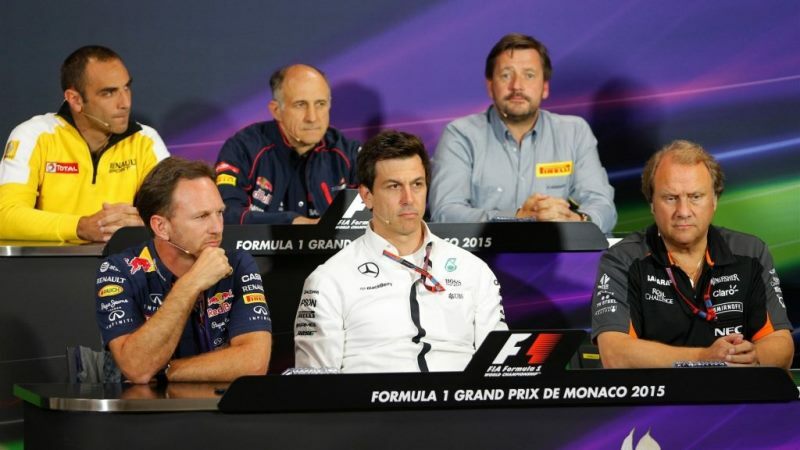 The Strategy Group can’t do anything on the costs side until the 2020 Concorde Agreement gets negotiated, something that won’t happen until 2018 at the earliest and cannot be implemented prior to 2020 – otherwise the big teams get pulled out by the entities that own them (none of whom actually get involved in the F1 Strategy Group or otherwise directly interact with anyone in F1 outside their own teams). Worse, they’d be able to claim against whoever put the changes in – unless it was the EU, and even that’s debatable – making things even more expensive for F1. The FIA cannot afford to allow the rule changes regarding redistribution as it’s not rich enough to pay the bills, and CVC would have no especial reason to bail out the FIA since it could get a rules-maker more in tune with its own thinking if the FIA is collapsed through big legal bills. If certain big teams are to pull out, it’s cheaper for them to at least wait until F1’s collapsed enough for them to get their golden parachutes. The F1 Strategy Group isn’t “offering” to run a third car. Under the regulations as they stand, it’s forced to field *three* cars if that happens and the FIA gives 60 days’ notice that it wishes to activate the clause. So if, say, Red Bull stormed off today without getting a replacement, the FIA could declare the clause active tomorrow and the three extra cars would be obliged to appear at Spa. The “studying customer cars” is because Force India objected to putting it into the rulebook right away, and is probably an empty promise designed to make it look like they’re doing something without the team bosses’ paymasters being put into a situation where they feel pulling out is the only option. So, in reality, the Strategy Group is offering nothing at all – because it cannot. Interesting as always Alianora. Thank you. Yes, the sport is seemingly intertwined in it’s own web of complexity (ownership and management in this case) and waiting till 2018/2020 for major cost changes to take place would be foolish. The Strategy Group is a sham (at best), but that is again down to how the sport likes itself to be structured. The ‘third car’ clause would be a dangerous one to enact and about ‘customer cars’, there’s the worry that competitiveness will be compromised over costs vs. earnings discussion. Not something I am in favour of! Let’s see what the future holds for the sport.